The real estate industry isn’t necessarily known for its tech-savvy entrepreneurs. Many deals are secured in informal social settings with verbal agreements, and contracts are signed on paper and then faxed or emailed. On the surface, there doesn’t seem to be much need for innovative, high-tech ways of doing business. But in reality, much more goes on behind the scenes that could use a little technological boost. We always love to hear the stories of how DocSend is applied in unexpected ways or in industries that may not have been on our radar and we hope you share those stories with us! Right now, we’re happy to to share the story of how White Point Partners applied DocSend to the real estate business in order to manage their deals and secure property investments. White Point Partners is a private investment firm that is intentionally bringing innovative thinking into the real estate industry. Jay Levell, Ryan Hanks, and Erik Johnson founded the company in March 2014, and although they are a relatively new company, they’re already disrupting the way real estate investment is done. In short, they focus on the acquisition, development, and repositioning of real estate assets throughout the Southeastern United States. They specialize in ground-up multifamily and retail development, along with value-added acquisitions and redevelopment projects that help reshape communities. How do they do all this incredible work? Well, White Point’s transactions rely on a deal book. What’s a deal book? It’s a 15–40 page document that contains the specifics of the deal, the contract, and the risks and returns on an investment. What’s the big deal about the deal book? The deal book, like a pitch deck, contains a lot of proprietary information about the company, about the investment, and about future strategies. Can you imagine the damage that could be done if this information lands in the wrong hands? And the deal book is at the heart of the investment transaction. If you want to close a deal and do it efficiently, you need to know who’s looking at the deal book and who’s interested in the property. Lastly, the deal book is a pretty large document. Those 15-40 pages can eat up anywhere from 12-35 MB. Some email clients run into problems sending emails this size. 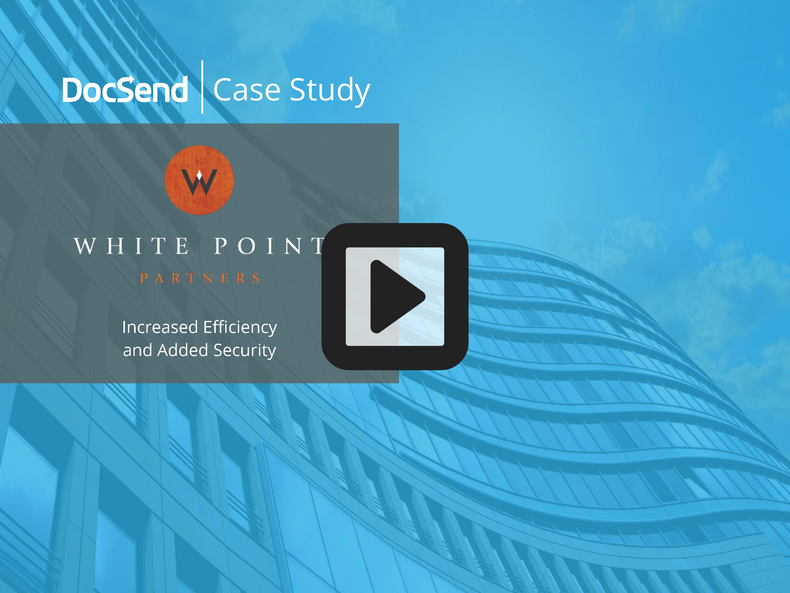 How did White Point use DocSend to manage their deal books? White Point started out by emailing their deal books to potential investors, which could create a headache in and of itself. Their email client could be a bit finicky about sending out those large files. And once the email was finally sent, they had no idea if anyone actually opened and read through the deal book. Even worse, they had no control over the security of their document—was it being forwarded to people they never intended it to reach? With DocSend, White Point has no problem sending out the deal book smoothly and securely. There’s no need to worry about large files email attachments when all you have to do is send out a link. DocSend’s links make it easy to secure the information in the deal books. If an unauthorized party gets ahold of their deal book, they can quickly turn off access to the link with a simple click. Confident that their information is secure, White Point can focus their energies on closing the deal. DocSend’s diagnostics take the guesswork out of this process: Knowing how much time an investor spends with the deal book lets White Point know who to follow up with. Better yet, when they follow up with a potential investor, they can tailor the conversation based on how much time an investor spends on certain pages of the deal book. All this information keeps the communication lines open and transparent, so they can stay on schedule and avoid missing a deadline and wrecking a deal. Bringing tech innovation into the real estate industry also brings added control and security to the investment process. White Point uses DocSend to protect the proprietary information in their deal books and to manage the time spent closing a deal with investors, making the whole process efficient and worry-free. Learn how healthcare startup Rock Health uses DocSend to secure their content, track what’s working, and get insight into key stakeholders.